Aluminium-boat manufacturer Quintrex’s new luxury cabin – the Ocean Spirit – is perfect for escaping for a weekend of cruising and relaxation. The new Ocean Spirit is available in 510, 530, 570, 610, 650 and 690 models, with a model to suit every family size or friendship circle. Featuring smooth plate like sides for a modern new look and the new Blade Hull the 610 Ocean Spirit offers a stable and smooth ride every time. The 610 Ocean Spirit boasts tough 4mm bottomsides, a large cabin and plenty of storage space including underfloor and bunk storage. The 610 Ocean Spirit also includes a faster self-draining design with a non-return scupper system. Featuring the new rear folding lounge the 610 Ocean Spirit is a versatile rig, as the lounge can be folded flush against the transom to create extra deck space perfect for the keen fisherman. With a new transom design internal space in the 610 Ocean Spirit was increased by 180mm and improved cable guides keep the transom area clutter free. 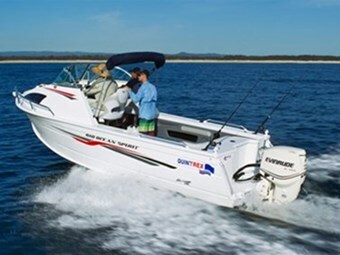 Quintrex national account manager Cameron Wood commented: "With a rating up to 200hp there is plenty of power behind the 610 Ocean Spirit and you get your radio, fishfinder, painted hull and solid aluminium ladder all included as standard." He added: "You can really option up your 610 Ocean Spirit to suit your needs, if you’re after water sports add a ski pole, transom door or ski hooks and if fishing is more your taste option up with rod holders, a rocket launcher, burley bucket and a live bait tank in the back deck." The 610 Ocean Spirit is available as a Quintrex Instant Boating Package, including boat, trailer, Evinrude Etec engine and a three-year factory warranty. For the latest boat reviews, subscribe to our Trade-A-Boat magazine here.